Tentative design concept as of March 2016. Final design subject to change. In recent years, the university invested heavily in the renovation of training, conditioning, practice and competition environments in or near Alumni Hall. And to ensure all of our Spartan teams experience a distinctive home field advantage, AU concurrently launched a search to identify a site for development of additional facilities. This effort culminated in the 2015 purchase of 45 acres of land less than a mile from campus. The parcel is large enough to accommodate championship-quality softball, baseball, soccer, and track and field venues. The first facility to be developed in the new Spartan Athletic Park will be a $1.7 million softball stadium. The site preparation phase of the project, which will require the moving of over 11,000 cubic yards of dirt, will begin this spring. Approximately 40,000 square feet of premium synthetic field turf will be required for the outfield, batting cages and infield surround. 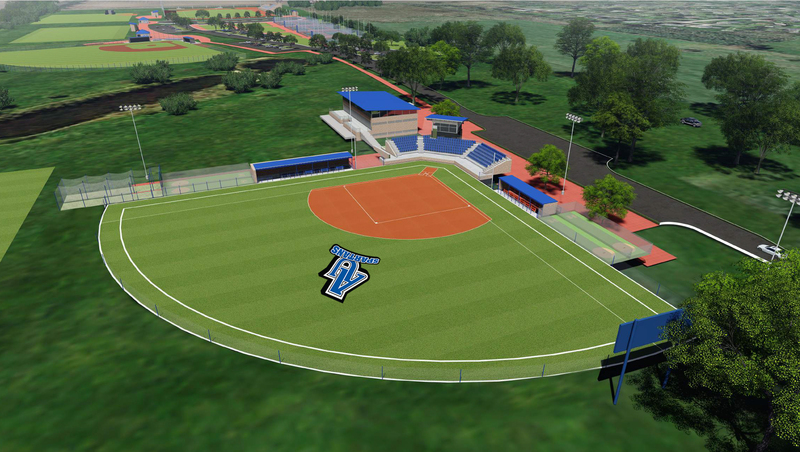 Fan amenities for the new softball stadium will include seating for 300 immediately behind home plate with natural grass areas along the first and third base lines for overflow crowds. A high-quality wireless digital scoreboard is planned for the outfield. The stadium will be completed with a two-story press box structure with live camera feed, public address system, restroom facilities and equipment storage.